Santa Monica Press, 9781595800817, 360pp. 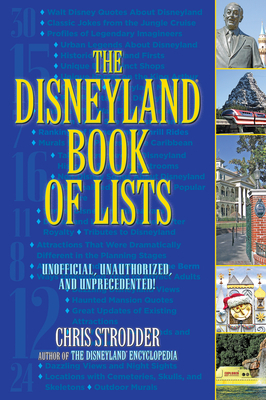 The Disneyland Book of Lists offers a new way to explore six decades of Disneyland(r) history. Hundreds of fascinating lists cover the past and present and feature everything from the park's famous attractions, shops, restaurants, parades, and live shows to the creative artists, designers, characters, and performers who have made Disneyland(r) the world's most beloved theme park. In addition to lists created by author Chris Strodder (The Disneyland(r) Encyclopedia), the book will include lists from celebrities, Disneyland(r) experts and historians, Disneyland(r) Imagineers and designers, and other current and former Disneyland(r) employees. People have been making lists since Biblical times (think Seven Wonders of the Ancient World, compiled 2,100 years ago), and to this.